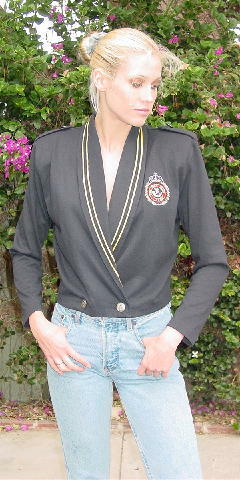 This black vintage jacket is 65% polyester, 35% cotton, and was made in Hong Kong. It has epaulets on the shoulders, shoulder pads, 2 outer front buttons, and 2 inner front buttons. Because of its design, the jacket can be buttoned either on the left or the right side. It has long lapels with 2 rows of gold piping extending all the way near the buttons. It has long sleeves and a round emblem (in the shape of a crown with golden branches and other designs) in red and gold that says New York Paris Rome. 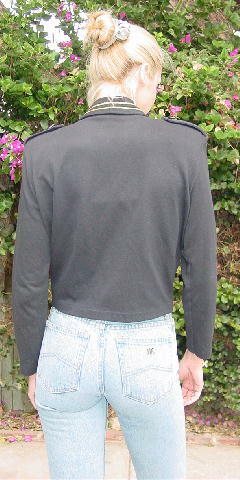 Because of its age, there is pilling on the jacket. It belonged to a New York model.